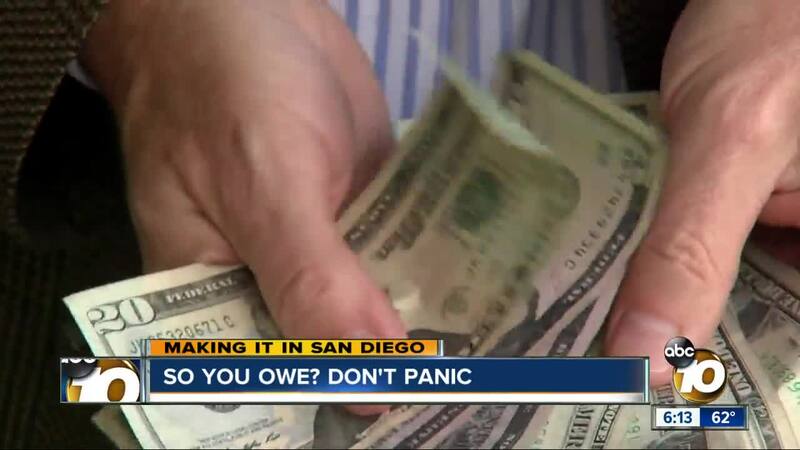 Making It in San Diego: It's Tax Day, do you owe? SAN DIEGO (KGTV) - It is Tax Day, and if you’re like most Californians, you’re probably wondering what happened to the nice refund you’re used to getting. Or worse, you owe the government this year. So how do you Make it in San Diego on Tax Day? We found an expert who can help. It's the worst sticker shock imaginable. You're used to a little something back from the government every year in the form of a refund, but suddenly you find yourself with a hefty bill. And the feds don't look kindly on late payments. "I always tell people: if you owe money, the first step is don't panic," says Ariel Jurow-Kleiman an Assistant Professor of Law at the University of San Diego. Jurow-Kleiman should know. She's helped people in this situation many times before as a tax attorney and now teaches tax law at USD. Here's the problem. "The Federal tax laws were changed in a way that will dramatically affect California residents," explains Professor Kleiman. And that's probably what hit you, too. Many itemized deductions you used to get were either tossed out or capped. "It used to be you could deduct all of your state income taxes," adds Jurow-Kleiman. Now those California income taxes are capped at $10,000. And your house, the interest on the mortgage was capped too - double whammy. So, if you owe, here's the first step: do not put off filing. "Absolutely, it is so important to file your taxes on time even if you think you're going to owe," says Professor Kleiman, emphasizing the point. There are penalties for filing late: 5% of your tax liability and up to a maximum of 25%. So, let's say you owe $1000 and didn't file for a month, that alone will cost you at least an extra $50. So, file right away, and pay what you can now. "There is interest, it fluctuates, right now it's 6%. It compounds daily so every day, every week that you owe there is a little bit more interest that's added on," warns Jurow-Kleiman. That compound interest can accrue quickly but Professor Kleiman says there are options. You could file for an extension and pay the full amount later. Or you could work out an installment agreement but know some fees could be tacked on. In some cases, paying off your taxes with a credit card could be cheaper than the interest from the government. "If you're considering owing money to the government versus owing money to a private lender,” adds Professor Kleiman, “It's very often better to borrow money from a private lender and pay your taxes." However, Professor Kleiman adds that’s not always the case. She advises avoiding payday lenders or someone who charges very high-interest rates. And there is help , especially for those with low incomes , the elderly and the disabled. We have provided links to the Volunteer Income Tax Assistance Program and the local Taxpayer Advocate . For local low income clinics you can call the University of San Diego LITC at (619) 260-7470 or Legal Aid Society of San Diego LITC at (877) 534-2524. Finally, make sure you don’t fall into this situation again next year by checking that you have the proper withholding in your paycheck. You can discuss that with your Human Resources representative at work or a tax expert.